Canada’s point based immigration system amaze and attract the skilled and talented people seeking permanent residency abroad. Although, a point based system makes the whole process organize and uncomplicated, however, if your point score or CRS Score (in Express entry language) is not very high, you tend to get concerned about your chances of getting Canada PR invitation in express entry. The lowest CRS score requirement in 2019 was 439 CRS points and that was too reached in the very last month of the year, i.e. December 2018. However, despite this lowest mark, IRCC invited significant number of applicants last year. In fact, record number of candidates invited to apply Canadian permanent residency in 2018 by IRCC. What will be lowest CRS score requirement in 2019? How many of the express entry candidates convinced if the cut off remain the same this year too? Well, I don’t think many would agree this idea, as most of the applicant who couldn’t get the ITA (Invitation to Apply) last year, desperately want the qualifying marks to come down to considerable extent. But what would be that considerable mark? Well, it’s very hard to predict the precise lowest point score for this year, however, one may expect it to be somewhere around 430-440 mark. This is simply because CRS score of the majority of express entry candidates ranges between this, as per the status in the first week of the January 2019. However, this is just the speculation and there is no concrete assurance that the Express Entry draw results be like this. Also read– How to Score High Points in Express Entry System? The high express entry target for this year, i.e. 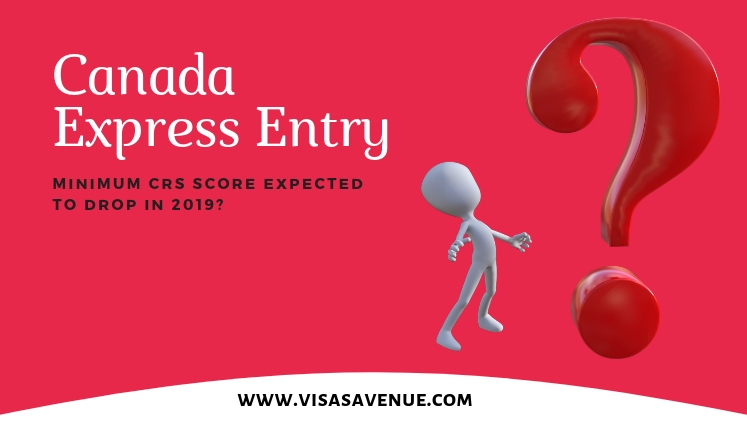 81,400 is another factor that support the theory of expected fall in the express entry minimum CRS (Comprehensive Ranking System) Score in the year 2019. To meet the massive annual immigration target for the EE System this year, IRCC may consider dropping the cut off marks in few of the EE draws, so that more number of candidates can be invited through such draws. What you need to do as an applicant of Canada PR? If you are an applicant of Canada PR registered in Federal Express Entry System, you must make effort to explore the other immigration programs to apply, i.e. Provincial Nominee Programs (PNPs). The PNPs nominate the applicants for Canadian PR and keeps relatively low process requirements and parameters with regards to point score, language proficiency score, etc. In case, you require support and assistance from a migration expert, you may get in touch with Visas Avenue- the top and accredited Consultancy firm for Canada immigration and PR process. You may contact Visas Avenue migration experts on Toll Free Number- 78-18-000-777. Moreover, to get your eligibility checked and subsequently, receive a call from the expert, you may fill the free assessment form.